Figs are delicious, taste kind of like grapes, but a little earthy and softer. I just love them. I loved dried figs, but fresh figs are a vastly different experience. A good variety of fig tree to grow is brown turkey fig. It produces abundant medium to large figs. It is a little more tolerant of cooler temperatures. Figs grow in warm climates. They are recommended for zone 8 or higher. If you don’t know your hardiness zone, click here to check it. We grow our brown turkey figs in zone 7a. The bush usually dies back every winter, but it’s not cold enough here to damage the root system. Figs actually grow on a bush and not a tree. It’s a really pretty bush and has gorgeous foliage. I love it for an ornamental in my yard. Plant figs when they are dormant such as early spring or late fall in the full sun at least 20 feet from any buildings or other trees. Remove the bush from the pot, unwrap any wrapped roots, dig a few inches wider than the size of root reach and a little deeper. Plant the bush 2-4 inches deeper than the root line originally was. You can tell where it was because it’s darker under the soil line. Figs will take a few years to produce fruit. Generally, it takes 3-5 years to harvest your first fig fruit from the bush. Figs bushes are a great container plant. You can grow them in a large pot and bring them inside in winter if your climate isn’t warm enough in winter to grow figs. You’ll probably want to have casters on your container because it will be heavy and hard to move. Container figs will need more frequent watering outdoors and more nutrient as that continual watering can wash away nutrients. Figs will need to be watered deeply once a week unless the area receives regular rains weekly. There is no need to fertilize fig bushes if they are planted in the ground. A heavy mulch around the base of the brown fig bush will help the plant retain moisture and it will protect the roots from getting too cold in winter. Remove dead or diseased branches in the dormant season, but there is no need for much pruning. If the branches die back, prune them off near the ground to allow more room for your new growth to come out in spring. 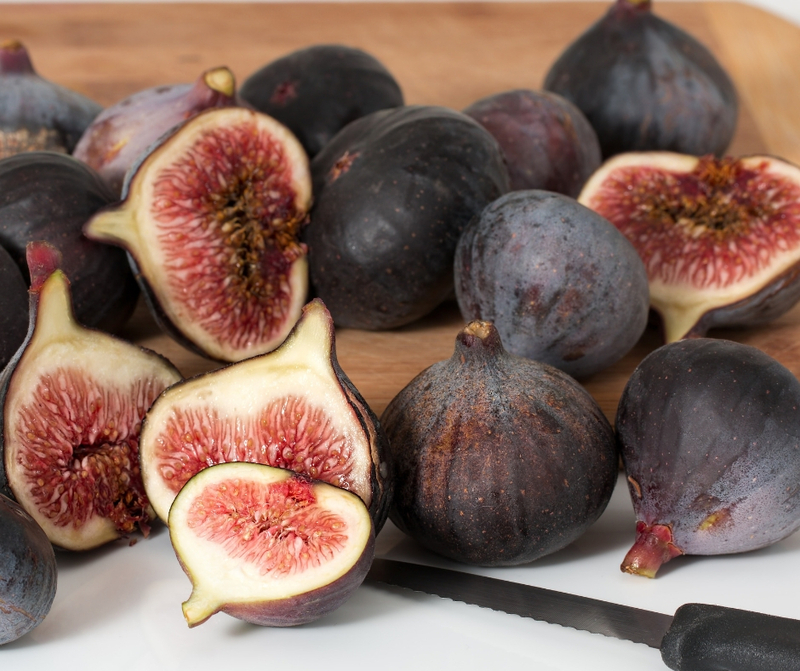 Harvest figs when they are dark brown and slightly soft to the touch. they will not continue to ripen off the bush. If they are weeping, shriveled, moldy or look otherwise diseased, discard them. 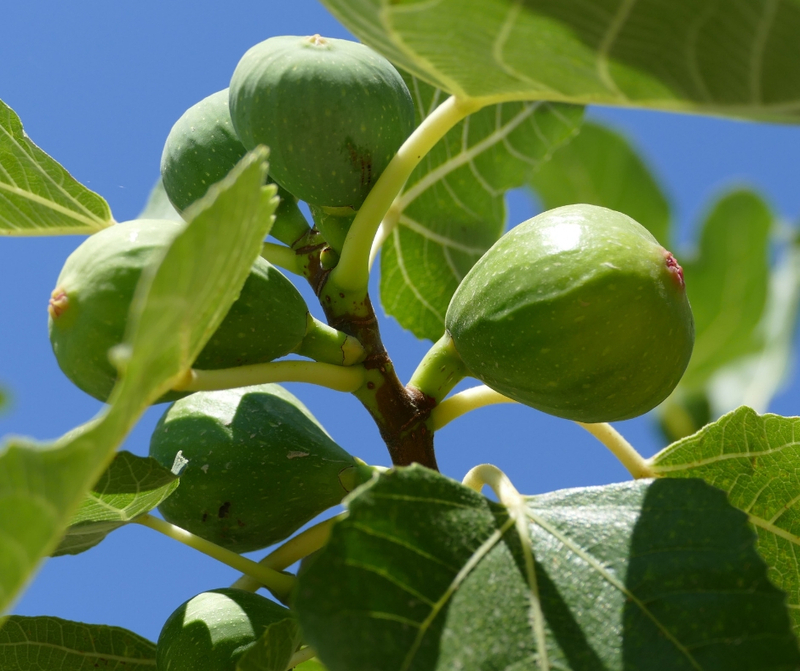 Your fig crop will mature in later summer and into early fall until it freezes. Wear gloves when harvesting as the sap and leaves can irritate the skin. Figs are very delicate and will become damaged if you squeeze them too hard while harvesting. Carefully grasp the soft fruit and pull downward. The stem will kind of pop and they will come off easily then. Store them in the refrigerator for 1-2 days. They don’t last long, so gobble them up as soon as you can. You can also freeze them. I like to cut the stems off and slice them in half so they are easy to dump into a recipe. You can also dehydrate them and make your own dried figs. Where to buy fig trees. You can get fig trees at your local garden store. The big box stores sometimes don’t have the best quality, but you can look at the foliage and shape of the branch structure and also check the bottom of the pot and see if roots are growing out and it’s totally root bound. You can also check for bugs or pest damage or fungus. You may be able to find good ones there. You can buy them online at fast growing trees, stark brothers, gurney’s or even amazon sells fig bushes. Once you start getting a big crop of figs coming in, you’ll need recipes for figs. Check out some of these ideas. For other unusual things you can grow check out these posts on growing your own luffa sponges, growing okra or check out the blog for many more articles on growing your own food. We just bought 40 acres in central Oklahoma and fig and peach trees were my first investment! No one seems to grow them here, but they’re doing well for us! Nice, what a great idea. You’re welcome, it looks awesome! Fig trees are gorgeous, you can even grow it in the front. We have ours as part of our front yard landscaping. 🙂 Thanks for reading the article! Love these tips and the recipes. Thank you for including my chicken breast recipe!